In 1927, Mack Sennett built a new studio on 20 acres in an area that at the time was known as Laurelwood. 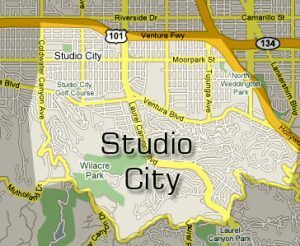 The area around the studio was soon renamed Studio City. Since then that 7.11-square-mile area has blossomed into a bustling, gem of the San Fernando Valley. Some Studio City Neighborhoods have emerged as sought after locations. The Studio City boundaries are Ethel Avenue to the west, The 101 freeway to the north and east and Mulholland Drive to the south. Median household income in 91604 is $95,138 with 448 households earning between $35,000 to $40,000 annually.